You took our nightmare of selling a house and turned it into a great experience! I was the executor for my Father’s estate. I and my three siblings all live on the east coast, whereas our Father live in Edmonds, WA. When he died we were so worried how we were going to mangage the sale of his home from thousands of miles away. And then we found Kippie! She was amazing. She handled everything, from getting the house cleaned and repaired, to yard work and marketing. In the end, the house sold for $31K over listing price in five days! We could not be more pleased! She is so nicec and friendly, calm and with a can do attitude. All of us would recommend her without hesitation. I, personally, will miss dealing with her as she became a real friend! I just wanted to briefly thank you for the wonderful job you have done getting my Dad’s house ready, listed and sold at a good price, in a timely fashion. Everyone has spoken very highly of you right along, so I just wanted to chime in with my belated word of appreciation. A sweet, nice and intelligent person. Dear Kippie-Yes, from the start to closing, your help was invaluable in the beautiful presentation and quick sale of the house. We’re grateful for your knowledge and flexibility and support in the whole process! Thank you, Kippie, for making this transition go so smoothly and well. Best wishes from Michigan. House is perfect! Cannot thank you enough for your doing your job so well. I am so happy with our choice of agent and house!! I cannot speak highly enough of Kippie’s negotiation skills. We have used her for three transactions. She helped us sell our home of 23 years. It sold to the first person who saw it. Thanks to Kippie, we got more than we were asking and the house showed very well. She helped us buy and rental home as well as downsize to a new primary residence. In both purchases, we were up against multiple offers and won. She was masterful throughout the whole process. Not all real estate agents are equal. She stands out above the rest in my book. We first met Kippie at one of her open houses. We were planning to sell our home some months later and were impressed by her knowledge of property values in the area. She provided comps for houses simular to ours and provided advice for staging our home before we had even signed a contract with her. At the time we did decide to list we needed to get the process going quickly and she did a great job making that happen. Our home sold in 2 days. She continued to follow-up with miscellaneous items after the offer was accepted. We would highly recommend Kippie to anyone thining of selling or buying a home. My family interviewed 4 realtors to sell our family home. After meeting with Kippie we knew she was the right one! Kippie arrived at our door using her expertise and knowledge to help us prepare our home for the market. She staged the home and made all preparations (which were awesome) making it so easy for us. Kippie went above and beyond with respect to the sale of our home and she made the entire process an actual pleasurable experience. We ended up selling the home in less than a week and receiving $37K more than List Price. We would strongly recommend Kippie to anyone buying or selling a home. We would personally use her again anytime in the future. I would highly recommend Kippie Pasowicz if you want to sell your house. Bottom line she worked with me for over two years to help me organize and accomplish the steps to getting the house ready to sell including repairs and prioritizing the moving process. She really was good about offering advice and listening to my needs. She has many contacts that are very reasonable to do painting, yard work and carpentry that are available immediately. Our house sold quickly, pending one week after we put it on the market for the price I wanted. Then when we found our condo, we were told they were already looking at a offer that evening and I would have to submit the offer and get the paperwork in within a three hour time limit. Kip was able to personally make our proposal that evening. We actually got our Condo we always wanted without any problems. She is a great friend and I really admire her gumption to make it happen. Her experience on how to pace the process and her knowledge of the industry really helped me to get what I wanted. My husband and I are veteran home owners/sellers/fixer uppers. We are also both architects and very particular about what we wanted for our next home. In the past we have worked with several real estate agents and have never been very satisfied with the results. We met Kippie at an open house and immediately knew we wanted to work with her to buy our next home. We worked with Kippie for about 6 months to find our new house and another 2 months to sell our exiting house. During our home search Kippie was both our advisor and our advocate. She talked us out of several properties including a bad flip house that would have been a disaster. Ultimately we found a great home within our budget that was move in ready. The sale of our existing home went better than we could have imagined. It was listed and sold with in 30 days for over the asking price. I highly recommend working with Kippie to buy or sell a home. She knows all the right people to call and helped us find a great mortgage broker. Kippie would respond immediately to all of our requests and made us feel not only like we were her only clients but that we were the most important clients. She’s not afraid to be strong when things get tough and I was glad she was on our team. We look forward to working with her again on future projects. “PIECE OF MIND & A GREAT OUTCOME! Moving across the country is enough of a headache without trying to sell your house remotely, but Kippie made this process so much easier for us. Our relocation company had us interview three realtors. We chose Kippie because she understood the selling points of our little bungalow better than others and had a clearly outlined approach to marketing it to a specific type of buyer (first-time buyers who love the Greenlake lifestyle). Throughout the process, Kippie was very responsive both by phone and email. We loved the photos she had taken of our house – she worked with the photographer to get the specific angles she wanted. She was very helpful when it came to facilitating repairs to the house and even checked the staging work with a wonderful attention to detail. It was great having an advocate on location. 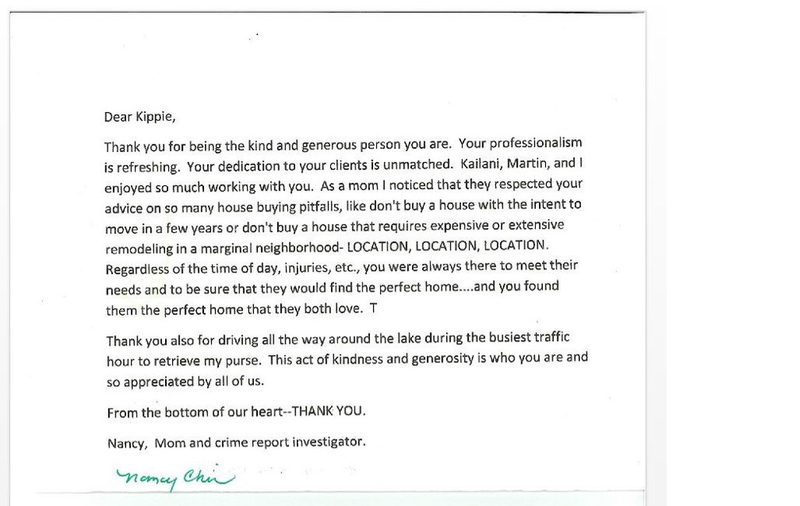 Kippie shared with us the comments left by realtors of potential buyers – they confirmed her judgement. The house was priced right and was ideal for the types of buyers we discussed. You were amazing!! Thank you for all you did to walk me through a sometimes difficult, but really amazingly quick process of selling my home! You were there immediately when we called and you were available for encouragement, guidance, and honesty, every step of the way. Thank you from the bottom of my heart. I will most certainly recommend you to others. We relocated to NW – Bothell area from Texas due to job relocation and chose Kippie as our agent out of the available choices of agents and never regretted it. We highly recommend Kippie Pasowicz to anyone seeking the services of a real estate agent as she was a fantastic real estate agent in helping us buy our home here in the Bothell area. Throughout the buying process she advised and helped us with her expertise of the area/market and the real estate process that is unique to Washington – a bit different than Texas. She was very patient and responsive with our demands and would always graciously accommodate our schedule and desires in finding the right house for us. She has a great enthusiastic friendly personality which reflects in what she does best – be an agent for YOU! We whole heartedly recommend Kippie Pasowicz. Go Kippie!!!!! Now that I’ve completed my move into my new condo, I want to tell you how happy I am that Kippie Pasowicz was my realtor through the process of purchasing my first home. I had never considered home ownership, but after initial conversations with Kippie and her banker, Susan Romei at Umpqua, I realized it was a reality! Kippie listened to me and it was wonderful to work with someone whose goal was to find me what I wanted. She kept me informed, had drive and was always energetic and upbeat (which helped on the days I wasn’t). Kippie recommended the best people to work with. From the banker to condo inspector and finally the movers, having those references saved me time and stress. Kippie’s advice and guidance helped me through a process that was complicated and overwhelming and made it manageable with an outstanding ending. I recommend Kippie to anyone wanting to buy a home. As a first time home buyer, I had so many questions and Kippie fielded them all, with clear, understandable answers. Buying my condo was such a life-changing process and I’m so thankful Kippie was the realtor that helped me through it. Kippie is the real deal. She was my great as I listed my property-from 3,000 miles away. During the process she was professional, honest, timely, connected and tenacious. She got the place ready to show, marketed it, got to know my neighbors, followed up one every lead, kept me in the loop and in the end- Kippie “sold” my condo! Kippie is the real deal. She was my agent as I listed my property – from 3,000 miles away. During the process she was professional, honest, timely, connected and tenacious. She got the place ready to show, marketed it, got to know my neighbors, followed up one every lead, kept me in the loop and in the end – Kippie “sold” my condo! Jocelyn I recently had the opportunity to work with Kippie when I was handling the financing for the buyer of her client’s home. Kippie was such a pleasure- very professional and courteous. She was proactive in calling me to make sure the buyer’s financing was going well at each stage in the process and really watched out for her seller’s best interest. Kippie has a fantastic reputation for representing both buyers and sellers and I can tell you my experience with her was stellar. I highly recommend Kippie without hesitation. We asked Kippie to sell our house. She exceeded our expectations and sold for the price we wanted. She is resourceful, professional, and responds very promptly. We would definitely use Kippie’s services again and highly recommend her. I have been through the purchase end of a deal previously, just not the seller end. Kippie was knowledgeable, throughly explained everything, easy to reach and answered all of our questions. She was professional, always willing to help and very proficient with advertising the house on the web and MLS. She also arranged for professional photographs of the house. The end result of our relationship, the house being sold in 5 days, for full price. Kippie assisted when it was time to move, by representing our interests with the driver of the moving company, so we could begin our drive across the country. My only regret is I am no longer a local resident and can’t spend time with my new friend. You’re more than a Realtor, your a wonderful, kind, compassionate person and a friend. I knew that from the very first time we worked together. We feel at ease knowing you will be taking care of the sale of our mothers house. Thank you again for all that you do! Thank you so much for your work on both houses! I know the buying transaction was rough with no help from the listing agent. Thanks for persevering! We knew it was the right house for us. 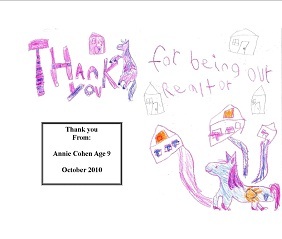 And thank you for facilitating a smooth transaction & getting us the best price for our house! Excellent service. Kippie was a great advocate for us throughout the process and did not rush us into making a decision. She will definitely be our real estate agent and friend for life! Kippie advocated for us to receive a one year warranty included in our mutual agreement and she negotiated with the other realtor around closing costs. Kippie went everywhere with us when we were looking for our home! I wanted to thank you for taking such good care of Jennie and Hin Sing. You guided them along – and provided wonderful and excellent services for them. I appreciate your high energy, attention to details and your professionalism. They are extremely pleased with your services and was glad that I provided them with a colleague that can help them with this major milestone in their lives. Thank you for the referral! I appreciate keeping my wonderful friends (without co-mingling with business transactions) and found a good realtor to refer my future friends who need a realtor!! You are the best!! Kippie is a very high energy person, she is very enthusiastic in what she represents and did a great joy in coaching us how to get our home prepared for the market. We feel she was very respectful to our home and our emotion (been in this home for 31 years, raising our children, etc.). Her little extra here and extra there helped buyers to know all the details of our home, we appreciated that very much. She did not have to negotiate much for our sale, we got 3 cash offers within 2 days after the open house. Swift and clean. I just want you to know that I truly appreciate your attitude and capabilities. You’ve been very helpful so far in this process — making it much more manageable than I expected. Didn’t want to wait until the end! We unequivocally and enthusiastically recommend Kippie Pasowicz to anyone seeking the services of a real estate agent. She did a fantastic job for us. Our home sold in a week in a slow market. Kippie showed great expertise at every stage of our transaction, from advice on preparing our home for listing, to pricing the home correctly, handling offers, monitoring the closing process, referring us to movers, and recommending a real estate agent in our new city. Whenever we had a question of any kind, Kippie had an answer. Kippie kept in touch with us constantly, even before we had actually listed our home. She is a great communicator. We always knew what was going on with our transaction. We give Kippie all the credit for our quick sale and smooth closing. Her skill and professionalism are unmatched. We heartily recommend Kippie.